This past September saw the of the 3rd Annual Smoketown GetDown for Democracy block party and the community spirit was out in full force. 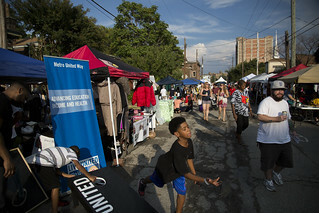 While the clouds looked a bit threatening at times on the evening of the 16th, not even a little rain could dampen the energy of the friends, neighbors, and vendors gathered together to share in the beauty of the Smoketown Neighborhood’s past, present, and future. Taking place again outside of the Jefferson County Chapter of KFTC’s office at 735 Lampton Street, with 54 sponsors (churches, businesses, non-profit organizations, and community members) and 45 community vendors (food/drinks, non-profits, churches, businesses), our party was a fantastic success. 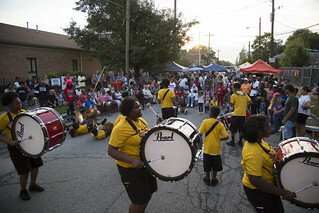 Louisville has seen a violent year, and with recent tragedies fresh in the minds of many in attendance, the Smoketown GetDown--a yearly event that only seems to be gathering more and more steam each year--was a firm realization of everything that is real and great about the the oldest historically-black neighborhood in Kentucky. In speaking to community members in attendance, the heartfelt connection and appreciation of the place and event was obvious. "I wondered how this event would be. With the recent tragedies in the community I wondered if we would be able to come together. We did. We laughed. We danced. We made art. We ate tacos and licked gourmet ice cream cones. We listened to the beat of the drums. We connected. We were walking, living and breathing what community should be. Not just one day but every day. For that moment we took it all in, hoping that the Get Down got down into our souls and made us stay connected as one community- Smoketown!" - Hannah Drake, Project H.E.A.L. With this year’s GetDown for Democracy, Smoketown had a lot to celebrate. 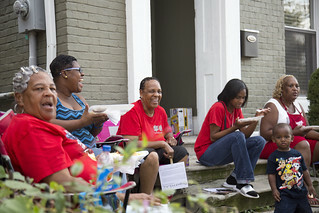 Moving into its second year after reorganizing, the Smoketown Neighborhood Association recently held board membership elections and is in a strong position to continue its momentum in making its neighborhood a place that everyone can thrive. This effort is already strongly evidenced by their recent work towards making sure that a currently constructed combined sewer-overflow basin is built underground (rather than the previous, above-ground design), respecting the neighborhood’s built environment and quality of life. And of course, the Jefferson County Chapter of KFTC also did an amazing job in growing its capacity and furthering its mission: we added five new member registered nineteen people to vote! With the amazing community partners that we have, we can’t wait to see what next year’s Smoketown GetDown has in store.